Somehow, in the last almost five years, I’ve forgotten to have my kids’ photographs taken. 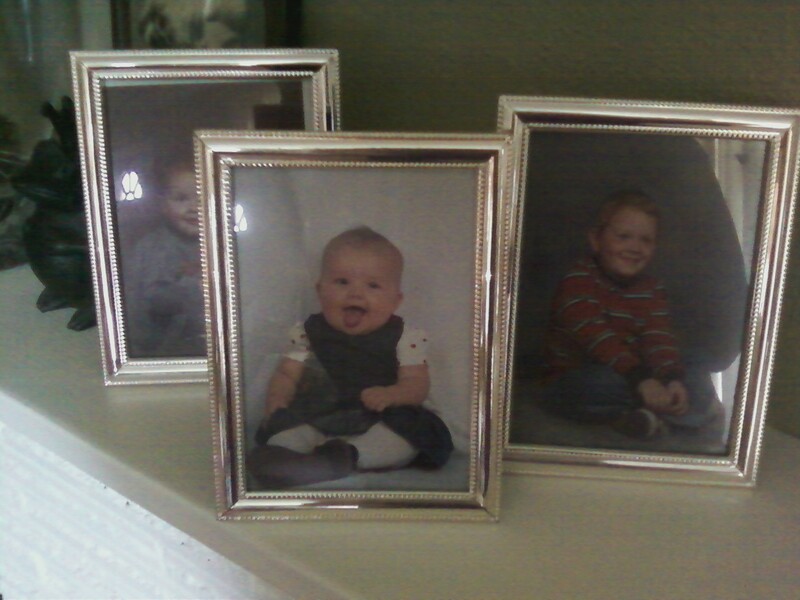 In a fit of cleaning this morning, I was dusting and stopped to look at these charming little silver-framed portraits. Ohhh… I thought- look at what a darling little juicy chub Abby was- and Bean! oh, he’s so cute…he’s also TWO and a half years old! and wait a minute- Jeffrey was in Kindergarten here. Oh. My. Heck. It’s been that long since I updated their portraits? MomFAIL. In all fairness to myself, there are snapshots aplenty of all the milestones and the daily miscellany- and there is the blog, which is a nearly daily record of their lives- and yet, there it sits, the gaping gap in the photo record. When I look at these pictures, it’s bittersweet. I hadn’t told you all- only a few close friends knew anything- but by that time, my X was already deep in the Rx bottle and I was clinging to holding my marriage together. When I look at Abby’s sweet six-month old face, tongue sticking out and cherub cheeks, it also comes with the reminder than we were then two-months post-apocalyptic life and headed to another relapse and OD. It’s probably time to write some new history. Heading to the run of the mill portrait studio isn’t for me anymore, so I think I’m going to be on the lookout for a photographer who might trade me a painting for some portraits- and maybe this time, I’ll even allow myself to be included in the record of our family. Do it! All of it! I don’t know any photographers in WA, but I know several in UT. Let me know if that should prove useful. Ask Celeste! She had a gal do her’s awhile ago that were super cute and not at all run of the mill studio-like. Be proud of the history you are writing. You’re a fabulous Mom! Okay that picture of Abby is scrumptious – I was to kiss her little cheekies! There always comes a time when you stop and realize that time is marching on – I had not had (good) photos in 6 years and was missing 2 of my 4 children!!! Hope you find someone good who is willing to barter, once they see your artwork there is NO way they could refuse! It’s been about 3.5 years since I had portraits taken of my kiddos, and I feel bad about that, too — heck, the youngest has never had one done. But I agree that going to a portrait studio just isn’t for me any more, and I don’t know a decent photographer where I currently live. I’m hoping when my husband gets a new job (soon, hopefully) we’ll move somewhere where I know someone who can take some good family pictures. I seem to know such people all over the country, just not any where I actually _am_. And I can’t wait to see gorgeous new pictures of you and your kiddos! Um, me? I’ll volunteer! I would love a Tracy M painting. Absolutely. Before our oldest went on his mission, we had a family picture taken – the first formal one taken since our youngest was 3 months old. (She turned 7 the day before he left on his mission.) I’m glad I’m not alone in this lagging portraiture! If you are serious, maybe we can set something up for SLC next month.